"The danger to America is not Barack Obama but a citizenry capable of entrusting a man like him with the Presidency. It will be far easier to limit and undo the follies of an Obama presidency than to restore the necessary common sense and good judgment to a depraved electorate willing to have such a man for their president. The problem is much deeper and far more serious than Mr. Obama, who is a mere symptom of what ails America. Blaming the prince of fools should not blind anyone to the vast confederacy of fools that made him their prince. The Republic can survive a Barack Obama, who is, after all, merely a fool. It is less likely to survive a multitude of fools such as those who made him president." Obama is just a more polished version of Jesse Jackson or Louis Farrakhan. A thinly disguised demagogue race baiter. How ironic that you have been taken in by an Internet hoax. A search on the website of that paper fails to turn up the reported "article." However, the version of this item circulated online provides no other contextual information (such as a publication date or headline) to help track down if and when it was actually published in Prager Zeitung. A search of that newspaper's web site currently pulls up only one article which mentions Barack Obama, and that mention is an incidental reference about the level of security provided to a U.S. president. How even more deliciously ironic that you would do it in a thread titled "low information Obama voters"
GoofyDoofus wrote: How ironic that you have been taken in by an Internet hoax. A search on the website of that paper fails to turn up the reported "article." It was a letter to the editor, not an article. Letters to the editor generally don't show up in Google searches. So sue me. Besides, Snopes is a librul site. The Goofster thinks he's brilliant as he engages in the old liberal favorite - genetic fallacy. What we do know is that someone wrote those words. Who cares who wrote them? Goofster is not concerned about the substance of the quote, but only looking to do a typical lib "gotcha." Put him on ignore. Life becomes wonderful. But you posted it dishonestly, as an article in a Czech publication. Really, did you have to go to Europe to find a hateful extremist rant about Obama? Isn't there enough of that right on this board? And all you can say is: "So sue me."? I wish I could, but lying and not taking responsibility for it is protected under the First Amendment. Really, did you have to go to Europe to find a hateful extremist rant about Obama? Isn't there enough of that right on this board? I have found the rants against 0bama on this board to be decidedly non-extreme and frankly far to flattering for someone of his immense ineptitude and nefariousness. So, in answer to your question... hell no there isn't enough of that on this board! Awww...poor baby. If I had a nickel for every lie told by a librul, I wouldn't care about A tax hike on the 1%. Well, Goofy, snopes has a well-known liberal bias. Go peddle it elsewhere because it has no value here. Secondly, you didn't look very hard. When this was first circulating, I did some research on it and discovered that it has been supposedly translated. I found the source but could not verify at the time because I don't read the original language. Finally, and most importantly, it really doesn't matter whether or not CC was taken in by a hoax. Suppose Glenn Beck wrote it and it was circulated as something from the Prager Zeitung. So what? The message is right on target. I note that you could not or would not dispute the truth of what CC quoted. How like a liberal ...full of sound and fury signifying nothing. Those who know can fill in the rest of the quote. So, in answer to your question... hell no there isn't enough of that on this board! And how is this a lie? Poor baby, do you undestand what lying even is? And how is this a lie? Poor baby, do you undestand what lying even is? “What happened that Social Security withholding in my paycheck just went up?” a poster wrote on the liberal site DemocraticUnderground.com. Democrats who supported the president’s re-election just had NO idea that his steadfast pledge to raise taxes meant that he was really going to raise taxes. They thought he planned to just hit those filthy “1 percenters.” You know, the ones who earned fortunes through their inventiveness and hard work. They thought the free ride would continue forever. So let’s explain something to our [low information] Democratic friends. In 2009, Mr. Obama enacted a “holiday” on the payroll tax deduction from employees’ paychecks, dropping the rate from 6.2 percent to 4.2 percent. But, like the holidays, the drop ended and, like New Years Day, the revelers woke up the next morning with a massive hangover and a pounding head. “_Alex™” sounded bummed. “Obama, I did not vote for you so you can take away alot of money from my checks.” Christian Dixon seemed crestfallen. “I’m starting to regret voting for Obama.” But “Dave” got his dander up over the tax hike: “Obama is the biggest f***ing liar in the world. Why the f*** did I vote for him”? Obama didn't want that to happen. You people did. It stayed in what is called a compromise, which was better than no bill at all -- I realize that concept is foreign to you, but there it is. Take responsibility for the parts of the Republican absolutes you got enacted. Don't blame Obama for your desire to kill Federal stimulus efforts that keep the economy feeding you your riches. I hope you had fun surfing for nasty quotes You RecFire guys really like to do that -- somehow you think an opponent's intemperance endorses your intemperance -- guess what? It don't. Oh, and by the way -- thanks for admitting you told a lie. Probably a moment of intemperance. You probably get many of those reading Rev Moon's newsscreed. Joel:"Obama didn't want that to happen." ha....Obama wants revenues to spend spend spend.....he could care less where they came from. And he gave the free candy (33% reduction in SS contributions) ......then had to stop the free candy...and the low info Obama voters screamed about 'tax increases'. Ha...it was merely taxes going back to where they were for decades. Joel:" Don't blame Obama for your desire to kill Federal stimulus efforts that keep the economy feeding you your riches." heh heh......'stimulus' efforts? face it..it didn't work. and worse, the deficit ramped up, the debt skyrocketed, and soon Obama won't have any money to borrow...no one will loan it to us at a rate we can afford. There are no cuts in the bill and you call that "compromise." Pffft! What do you mean? The Dems agreed to not categorically reject all cuts now... they'll wait a couple weeks. Yup. It was a compromise. And it stopped the disastrous plunge driven by 23 years of tax cut addiction. BTW, how do you get around in those huge shoes, and breath with that red rubber nose? And it stopped the disastrous plunge driven by 23 years of tax cut addiction. Twenty three years of Americans keeping their own hard earned money. What a disaster. Uh huh. The chuckleheads should have been banking that extra 2% they were getting in their pay. That's what I did. Then spare me all the BS about the debt ceiling, etc. If you think our debt is a disaster, it is a direct result of 23 years of tax cuts. The result of head-in-the-sand thinking like yours. Why won't you pay up for things you enjoyed and supported, huh? "Then spare me all the BS about the debt ceiling, etc. If you think our debt is a disaster, it is a direct result of 23 years of tax cuts." The problem is SPENDING, not taxing. Programs that escalate out of control. New programs not paid for and bleeding us to death. You won't live within your means. It's the welfare weenie and queenie entitlement mentality. Sorry.....we already collect enough taxes. We just blow more money than we should. You think there were enough taxes to cover where we are now and that raising rates has an equal bump in raising revenues? The results of thinking like yours, is opinions like yours, dumb as a rock. Just out of curiosity, why isn't it a direct result of the massive increase in spending? Would you be willing to go back to the last two Clinton budgets (FY 2000 and FY 2001)? I know that I certainly would, even if it meant a tax increase. Spending was only 18.2% of GDP back then. It was 22.8% of GDP in FY 2012, a 25.3% increase relative to the size of the economy. That kind of increase is staggering, and that was actually down from 24.1% of GDP for FY 2010 and FY 2011, which represented a 32.4% increase. Worse than that, the real per capita increase in spending was even greater than that since real GDP per capita grew over that period. And you would also have to remove from the comparison the cost of the two unfunded wars Bush chose to borrow money to pay for, as well as the impact of his tax cuts. And, and I don't know how this would impact things, but Social Security and Medicare, which are funded by special taxes, should not be rolled into the whole. Got any source that has done anything remotely like that? So 0bama is going to get credit for a tax increase not going into effect from a George Bush tax cut being returned to a Bill Clinton higher tax rate? So spending increased massively but it gets a free pass in terms of its impact on the debt? And why shouldn't Social Security and Medicare be "rolled into the whole"? Where do you think the money is coming from to pay benefits in excess of Social Security and Medicare taxes? And stop calling the wars "unfunded" unless you are going to also call unemployment benefits "unfunded," Medicaid "unfunded," and all sorts of other non-defense spending that has exploded the deficit. It's absolutely ridiculous how liberals demand that wars be funded but nothing else. They are perfectly fine with spending the money whether the tax revenue is there or not. Because Social Security is not out of money, nor is Medicare. As for ridiculous, Bush and you pushed two wars and tax cuts simultaneously, something you, not he, refuse to acknowledge. Talk about asinine. Btw, I think tax rates have to go up again to recover the years of wasteful tax cuts, and that will be thanks to extremists like you. Love how you wail about the wealthy paying a bit more and holler loud for treading harder on the downtrodden. If the Statue of Liberty were alive, she would hide her head in shame at the cruelty which the right so loudly claims is a tribute to true American liberty. Americans keeping their own money is called "wasteful." Disgusting. Do me a favor will ya? Take a moment to use the brain you were born with and ask yourself why anyone would even suggest paying more for something. They may be wrong, of course, but there must be a reason besides stupidity. What you need is a quantum leap in your thinking. You are so determined to see things in a particular way that is so ridiculously primitive that you can't see the obvious reality. Open up for a second and entertain the idea that is the basic foundation for all knowledge we currently posses and that is that whatever we believe may be wrong. I do this on a constant basis and it hasn't harmed me in any way. Step one- Why would perfectly intelligent people want to pay more in taxes? Remember that these people are supposedly perfectly intelligent and probably aren't morons. As I said before, they may be wrong, but at least there must be a good reason for doing something that seems so ridiculous on the surface. We paid the highest taxes during the war years. War is expensive. All Americans participated in the winning of those wars. For some reason, taxes were actually cut during our most recent wars. Wow- we have a deficit! Imagine that. 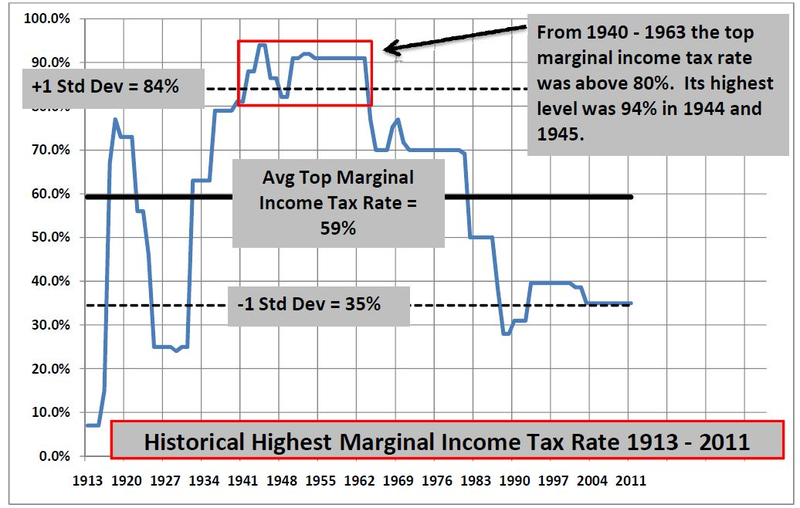 Our taxes are historically low. Guess what happens when you don't take in as much as you're giving out? You get a deficit. So, what do you cut? Hey, let's cut welfare, or social security, or other entitlement programs, shall we? What do the American people say? DEFENSE?? Holy cow. The vast majority of Americans want to cut defense. Neither party wants to do this- but if they want to win elections, they probably should. Politically it might be safer to raise taxes. The talking heads would not have so much of a field day crucifying them. Step one- Why would perfectly intelligent people want to pay more in taxes? I keep asking myself this very question => why do libruls want to pay more in taxes? But they apparently do. Makes no sense at all. None. What's disgusting is you cheering the tax cuts and war that built at least a fourth of the deficit, and during a time of relative economic strength. That's disgusting. Typical right-ing deadbeat. FACT: Owebama racked up more debt ($5.6 trillion) in his first term of office than all other administrations combined since the forming of this country. Oh, sorry...I was off by a few billion. The national debt has risen more than $5.4 trillion from its level of $10.6 trillion when Obama took office on Jan. 20, 2009. 1. $5.6 trillion is not more than half of a $16 trillion debt. As Clinton says, you guys seem unable to do simple math. 2. Our debts was $11.9 trillion at the end of FY 2009, Bush's last budget year. Which shifts money from Obama to Bush. 3. So what? Your math and your resopnse are diversions to my point, which remains: man up and take responsibility for the mess we are in, none of which was Obama's fault. The mess was, and is, the responsibility of Bush and the right wing, and remains so as the latter tries as much as they can to keep the country down. In the words of well-known bullies on this board: grow a pair and stop the conserve-tiv-it-to me whining. ...take responsibility for the mess we are in, none of which was Obama's fault. On what did Owebama spend $5.6 trillion in four years? Is there an accounting published anywhere? Ask Paul Ryan, why don't you? More spercifically, he spent money on propping up and restimulating the economy -- as much as the extremist minority of Congressmen in control of the House GOP would allow -- and he started to wind down the Bush wars. Oh yes, he eliminated useless private sector middle men -- high price welfare queens, I'd guess you call them -- from taking a huge bite out of student loan payments. Killed OBL. Helped overthrow Qaddafi. Stuff like that. I don't think he did enough, and some of the things he didn't do I wish he had -- like close Gitmo, but since he is not a dictator as you people like to hope he would be, he has to work within the system, even when it is held hostage by a rabid minority of unrealistic ideologues. Still, I'm waiting for you to own up to your share in supporting Blush and his borrowed wars and tax cuts that for the rich that did not contribute to a healthy or growing economy. But I won't hold my breath, heh heh. I know how YOU think the money was spent. I asked if there's an accounting anywhere such as the Congressional Budget Office. Have you seen a bona fide accounting of expenditures in Owebama's first term? Bona fide? You mean non-partisan, or one that tries to back up your preconceived biases? Yuk yuk. Yes, non-partisan is of course the proper word. Is there a non-partisan accounting of what Owebama spent $5.6 TRILLION--more than all other administrations combined since the founding of our republic--on during his first four years in office? Is there a non-partisan accounting of what Owebama spent $5.6 TRILLION--more than all other administrations combined since the founding of our republic--on during his first four years in office? By the way, Bush spenct $8.9 TRILLION in his first four budgets, so where does your outrage go now? Yes. By the way, Bush spenct $8.9 TRILLION in his first four budgets, so where does your outrage go now? Now you'll have to prove both those statements. Put up or shut up. These numbers weren't just taken out of the air. The OP got them from somewhere. I would also like to see the source of the claims. I'm bored, maybe as lazy as you. Google it and find your error. No, you're a librul. They make things up out of whole cloth.